A silky top and comfy pants. A perfect outfit for lots of errands. Untucked just doesn't seem to look as polished. 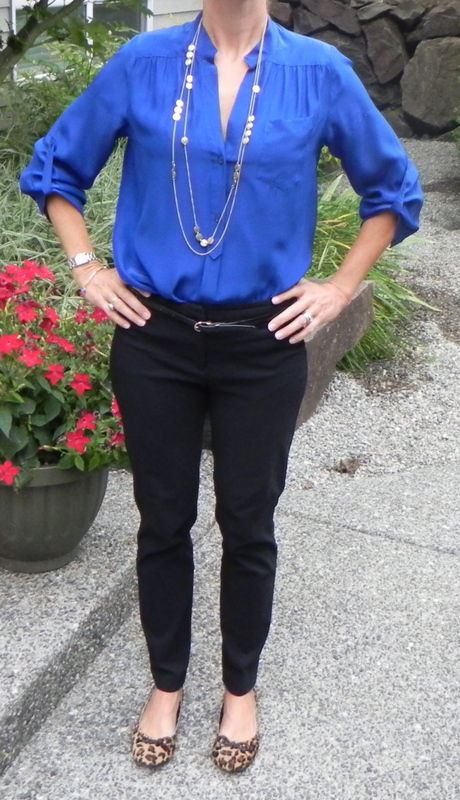 I never used to wear black and blue together- partly because they were my high school colors (go Lancers! ), and partly because I was worried I’d look like a giant bruise! Thankfully, I’m over that- because these 2 colors actually really work well together. I am going to be in and out of my car a bunch today, so I wanted something that was easy to wear, comfortable and I can maneuver easily in. I went with one of my favorite pants- these cute black ankle length ones. They are made of rayon, lycra and nylon- so the fabric literally bends with my body~ I love it! I also love that they are ankle length. In my mind there is something very Audrey Hepburn about these. Maybe not?! I paired them with a bright blue silk top. Again- I went with comfort first. This top, being silk, feels like heaven! I have always worn it untucked- but today tried tucking it in (loosely) and actually like it so much better. 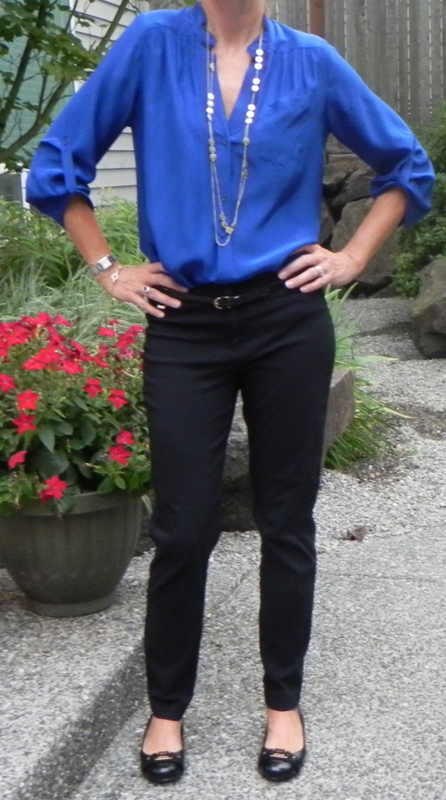 To complete the look I threw on a skinny belt, a necklace and black flats. I then decided to change things up a bit and tried my new leopard flats. Which is cuter? You tell me! I love having one unexpected item in an outfit. Today it's the leopard shoes! I love what you’re wearing! And both shoes look really good; the black looks great, but the leopard really adds that little extra kick to the outfit. What a fabulous outfit! I like the ankle-length, too. And I love the leopard-print shoes but not so much with that outfit. Oh and I like it tucked in better, too. I can’t tuck in my own shirts due to the buddha belly but I do like that look on you. I vote for the leopard! great outfit! love the bright blue!! !